A Crowd of 150 watched a tremendous cup final at GREENLAW, Castle Douglas yesterday, April the 6th, 2019. With two very evenly matched teams Cartha were the favourites from a higher division but the boys in Black from Bonny Galloway dug deep to win the trophy. Stewartry started very hard and fast an put pressure on the Cartha defence line. Cartha resisted the first two or three pushes but on the third series of plays Fraser Forsyth scored. Stewartry kept up the pressure until the end of the first quarter when Cartha came right back into the game scoring a fine equalising try after excellent forward work. Stewartry came right back though and Frank Gwynne slotted over a penalty from well out to make it 8–5 to Stewartry. Stewartry ended the first half with a player sin binned for a high tackle. The 2nd Half played out similarly to the first half with 14 man Stewartry scoring in the corner (Lochie Spence). Cartha however bounced back quickly and scored another unconverted try. 13-10 to Stewartry. The blacks stepped up another gear though and won another penalty which Frank Gwynne slotted over easily to make it 16-10. Now in the last 15 minutes it was only serious tackling putting body on the line which kept Cartha out. Stewartry has another player put in the sin bin so had to play 10 of the last 15 minutes back at only 14. Tommy McGrath put in a massive cover tackle to knock the stuffing out of the away team and himself as he had to go off injured. Lochie Spence put in tackle after tackle to help pin Cartha back until Stewartry had 15 men on the park for the last 5 minutes. A massive kick and chase upfield ran the clock down and pressure by Ali Wood forced Cartha to knock on and the game was over. A well deserved cup and league double for this excellent bunch of players. 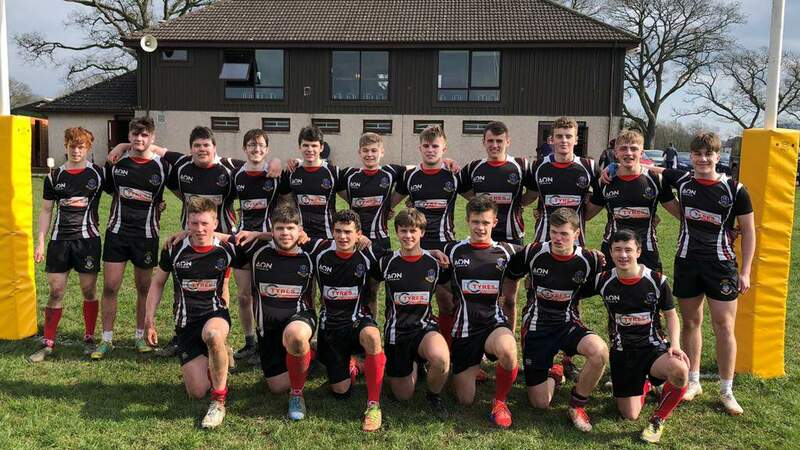 Only the sevens tournaments remain now with Dumfries (Cussie Cup) Sevens next Sunday and Ardrossan Sevens on Saturday 18th May for a final fling. So many players put their bodies on the line in this game but the one who did it the most was surely centre Lochie Spence who deservedly was made Man of the Match.